Spamalot tells the legendary tale of King Arthur and the Knights of the Round Table – sort of – and features a wide variety of silly things, including flying cows, killer rabbits, Knights who say “Ni”, men-who-are-almost-but-not-quite-dead-yet, and shrubberies. In short, it’s what you would expect of a work written and reworked by a member of Monty Python. As a lifelong fan of the film Monty Python and the Holy Grail, I’ve been meaning to catch Spamalot, its Broadway musical incarnation, for some time. If, like me, you’re a fan of the film, you will notice large changes to the plot and a significant increase in musical numbers, including the addition of “Always Look on the Bright Side of Life” from another Python film, The Life of Brian. All of your favourite elements will be there: the black knight, Tim the enchanter, Arthur’s entourage of silly soldiers – however, they won’t happen exactly in the order you are expecting. The Lower Ossington Theatre always manages to impress with their sets, lighting and video projections, and Spamalot is no exception. The set is notable, particularly for its size – I wouldn’t have thought it would fit into their mainstage space. I especially liked the recessed lighting in the clouds and the sun sporting a moustache. The projections were also well done, and added a lot to the show. All of the performances were a joy to watch. Most of the cast played multiple parts, and each role was distinctive. In some cases you would hardly realize it was the same actor. The standout performer is Emma Ferrante as The Lady of the Lake (a new character, for the film fans). She has a phenomenal voice and is very amusing as a mystical guide turned would-be stage diva. I have a few minor issues with the script. The conclusion in the musical version of this story seems abrupt, and there’s a particular song and its following story thread, “You Won’t Succeed On Broadway (If You Don’t Have Any Jews)” that seemed out of place with the rest of the show. None of these had a huge impact on my enjoyment of the show, however. 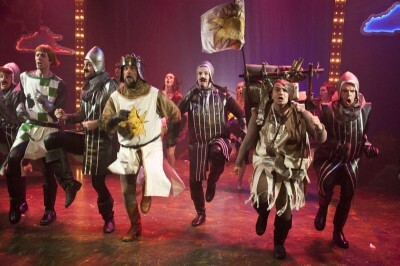 All told, Spamalot is a delightfully silly musical, and watching it was a lot of fun. Despite the changes to the source material, I highly recommend the show to fans of Monty Python and newcomers alike. Performances run from now until August 3, Thursday through Sunday, and again August 21 to September 21.